As sub consultant to Greenman Pedersen, Inc. AEA provided design services for the installation of two (2) CCTV cameras, five (5) Dynamic Message Signs (DMS), five (5) Variable Speed Limit Signs (VSLS), and eighteen (18) Overhead Lane Control Signals (OLCS) along the Route 495 westbound corridor for the control of traffic originating from the Lincoln Tunnel egress. This project was developed to provide for the control of traffic utilizing real time text and graphic electronic message displays and speed control signs to be deployed for advanced warning of complex traffic movements anticipated for the upcoming NJDOT Route 495 Bridge over Route 1 rehabilitation work. The bridge rehabilitation project will have a major impact on the PANYNJ operated Exclusive Bus Lane (XBL) system and adjacent traffic requiring additional provisions for OLCS relocations and replacements due to the project staging needs. 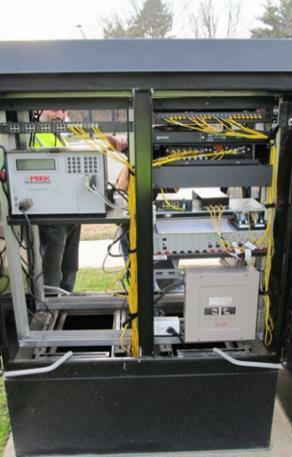 AEA provided detailed coordination work between the NJDOT, PANYNJ, GPI, the Authority’s current software developers (Transdyn and HSQ) for their VMS, VSLS, and XLB control systems including equipment vendors and various interdisciplinary departments of the Authority.